FRISCO, Texas (Feb. 3, 2017) – North Texas Soccer players Blaine Ferri and Bryan Reynolds Jr have been named by U.S. Under-17 Men’s National Team coach John Hackworth to the 32-man roster for the 2017 Spring Semester of the U.S. Soccer Residency Program in Bradenton, Florida. 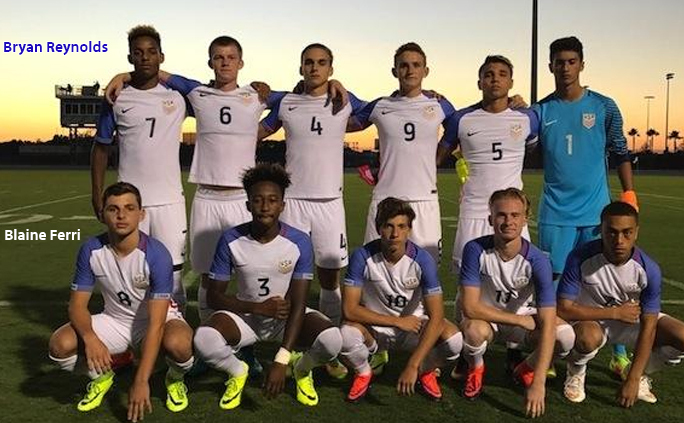 The U-17 USMNT will compete in the 2017 CONCACAF U-17 Championships hosted in Panama from April 14 – May 7 with a bid to the Under-17 FIFA Men’s World Cup on the line. Ferri is a veteran of the Residency Program after playing in 2016. Ferri was also a mainstay on the Under-17 USMNT last year while started a majority of the matches for the Red, White and Blue at the midfield position. Ferri started all four matches in the Mondial Tournament, where the U.S. took home first place. Last year Ferri recorded assists against England, Russia and Belgium youth teams in addition to scoring two goals in separate friendlies against Costa Rica in October. The Southlake, Texas native plays his youth soccer with Solar Soccer Club and reached the semifinals of the 2013 US Youth Soccer North Texas State Cup. Ferri also competed in the US Youth Soccer Olympic Development Program (ODP) from 2011-2013 and partook in US Youth Soccer Region III ODP camps. Reynolds Jr, who recently became the 17th Homegrown player signed by FC Dallas, is also a veteran of the Residency Program after joining Ferri in the Fall 2016 class. The Little Elm, Texas native split time between the Under-16 and Under-17 USMNT in 2016, and recorded goals against Costa Rica and Jamaica for the Under-17 side at the end of the year. Reynolds Jr played his youth soccer with Samba FC before joining FC Dallas. Like Ferri, Reynolds Jr reached the semis of the 2013 North Texas Soccer State Cup.